We have been in Japan for almost a year now, but – shame to admit – have not yet seen any sumo tournament. So typical of us… We have not been to Tsukiji fish market either even though it will be relocated to the outskirts of Tokyo by autumn. 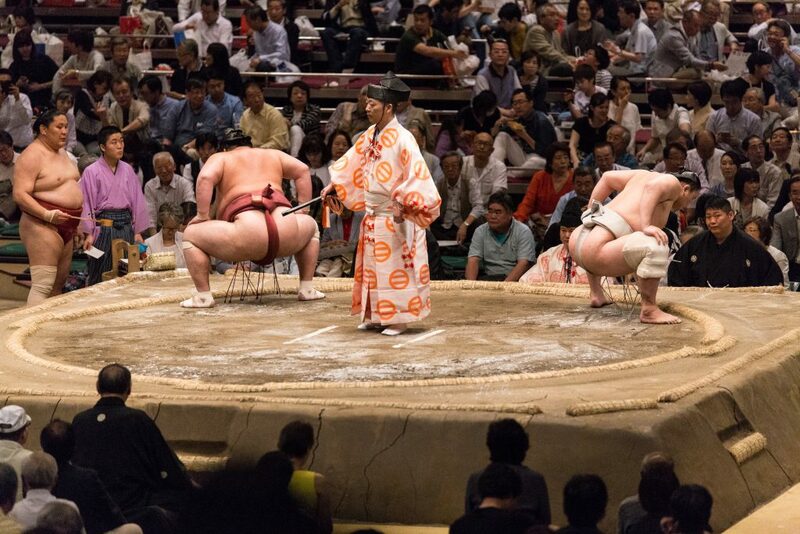 So when our friends from Brussels mentioned they were going to see sumo, we seized the opportunity. But you cannot just go to see sumo whenever you want. Tournaments (called basho) take place in January, May and September in Tokyo, as well as in March in Osaka, in July in Nagoya and in November in Fukuoka. Each lasts for 15 days. 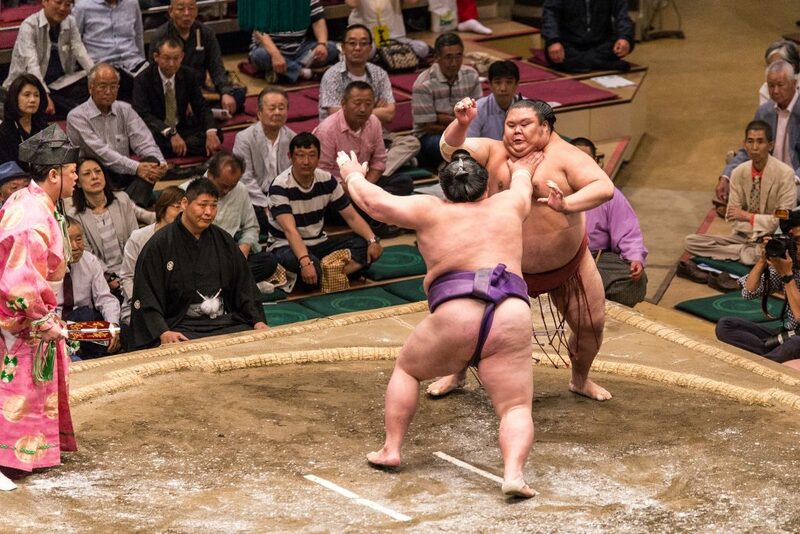 Together with baseball, sumo is one of the most popular sports in Japan. It dates back to the ancient times, when it was closely interwoven with religious rites. 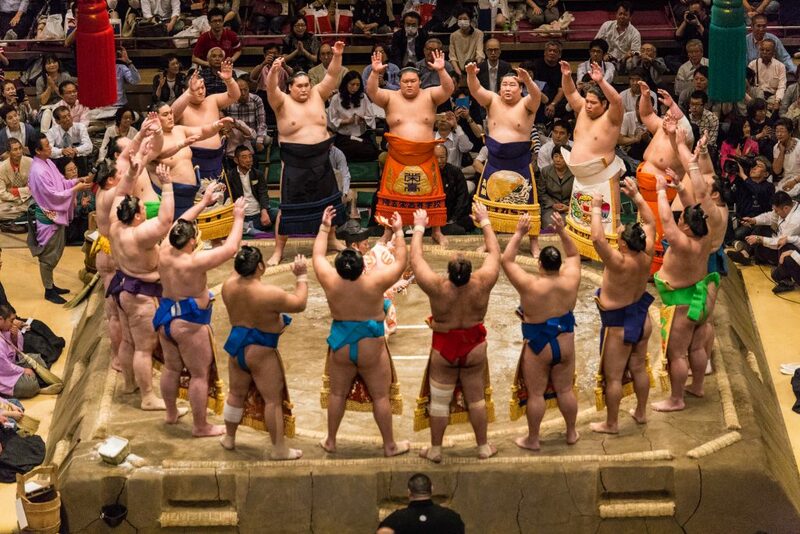 Until today, sumo wrestlers sprinkle the arena with salt to purify it and clap their hands to ask for gods’ assistance. All the rituals (introduction of the wrestler, greetings etc.) take way more time than the fight itself, which rarely goes beyond a minute and in the majority of cases is decided with the first impact. Interestingly, until 1928, there were no limits on how long the rituals could last. At the moment, they are limited to four minutes for the highest levels of wrestlers while the lowest ranks have to start the fight right away. Truth to be told, these rituals serve their purpose. This is psychological warfare between two opponents. The fight is won when the adversary is pushed outside the ring (dohyo) or forced to touch it with any part of his body other than the soles of his feet. Seen from afar, the fight may seem benign, but wrestlers do not spare each other. They slap and try to grab each others’ throats (if they can find them under all this fat). Spectacular falls are also common. We have seen several wrestlers being thrown out of the ring directly into the judges and photographers. Imagine being squished by the human replica of walrus falling from a height of almost one meter. This is not fun. Average wrestler weights more than 140 kg, but – unlike in boxing, there are no weight categories in sumo. Even if the size of the wrestlers is usually similar, we did see a few fights between Davids and Goliaths. It turns out that speed and dexterity are equally important as mass and strength. Japanese Sumo Association recognised 82 techniques of winning called kimarite. At the end of the fight, the speaker announces which technique was used by the winner. For instance, watashi-komi technique consists in pushing opponent’s calf forward with one hand while pulling his torso with the other in order to topple him. What is banned? Pulling hair, punching with fist and at the ears, strangling or grabbing by the mawashi pants at the jewels zone. Sumo wrestlers have semi-god status in Japan. But their life is full of hardship, filled with intense training and many restrictions such as a ban on driving. Their life expectancy is also shorter than that of an average Japanese man, due to common high blood pressure and hear attacks. According to Japanese Sumo Association, there are around 800 professional sumo wrestlers. They are divided into hierarchical categories, including maku-uchi (top category), Juryo, Makushita (junior category) as well as Sandanme, Jonidan and Jonokuchi (lowest rank). During the tournament, all the wrestlers are also divided between west and east (but there are no teams). Of course, getting into maku-uchi rank (around 40 wrestlers) and then winning the yokozuna (grand champion) title is everybody’s dream. The ranking, called banzuke, is reviewed after each tournament and the position of yokozuna is unique. It has been created in the XVII century, and once you get it, you cannot be downgraded. However, if yokozuna starts to lose fights, he is expected to retire. The unmatched record of 69 consecutive wins belongs to Futabayama Sadaji (1912-1968) who was the 35th yokozuna. There are many foreigners among wrestlers. Until 2002, there were no restrictions on the number of foreigners but since then it has been limited to one per stable. Still, between 2006 and January 2016, no Japanese wrestler has won the tournament. The May tournament was again dominated by Mongolian-born wrestlers. If you plan on going to see a tournament, do not show up in the morning. The day starts with the most junior fights and only around 16.00 big masters start to compete. 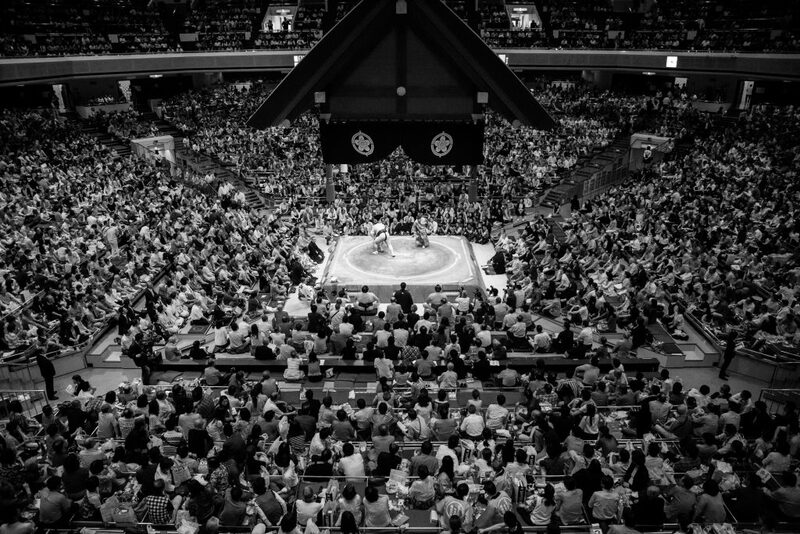 Tokyo’s sumo arena, Ryogoku Kokugikan, can fit over 11000 spectators. 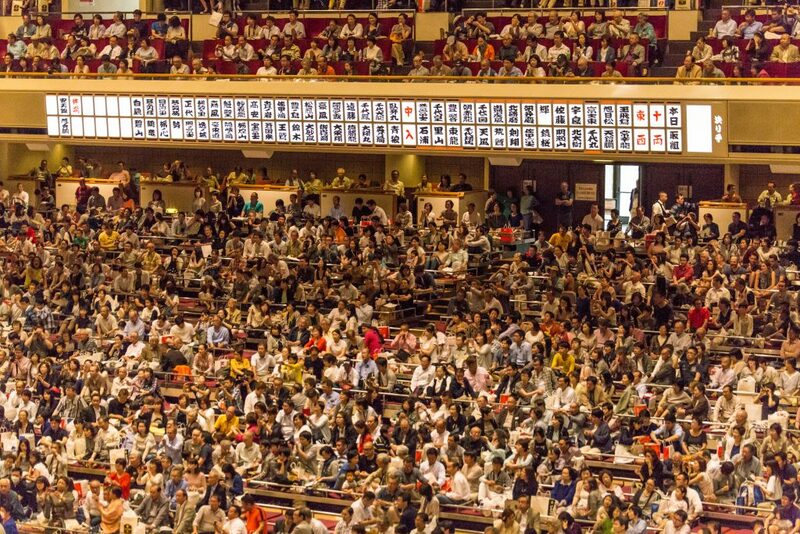 Around 17.00 the arena is filled to the maximum.Average spectators’ age reaches 50 years because the popularity of sumo among young Japanese is on the wane. For us, watching the public was even more fascinating than the fights themselves (apologies for this heresy). Reactions on wins and loses are loud, interrupted from time to time by chants in support of favourite wrestlers. People come in groups, with company colleagues and family members, munching their bentos and washing it down with beer. If you happen to be in Tokyo during a tournament month, book a ticket and go to see this incredible spectacle! 4) Współczesna Japonia w pytaniach i odpowiedziach: 現代日本 Q & A, Katsuyoshi Watanabe, Natalia Kuźmicz, Aleksandra Watanuki, 15 Czerwca 2015, Waneko Sp. z o.o.